Fading, staining, and cracking be gone! Leather interiors are no longer reserved for the elite few. These days, many makes and models of vehicles come outfitted with full leather interiors, but the most common hesitation buyers have is how to properly maintain the leather. The simplest way to prolong the life of your leather interior is to routinely vacuum it or use a slightly dampened soft cloth. It’s a simple approach that bypasses the complicated world of leather cleaners vs leather conditioners- both of which have different applications. Choose the wrong one and you could do more harm than good. Water can also be applied to leather via steam cleaning, and there’s a debate on the risks of adding steam to leather. Generally, you want to protect any leather from staining due to water. Shoe stores know this, and try to up-sell leather protectant or sealant when you purchase a new pair of leather shoes. 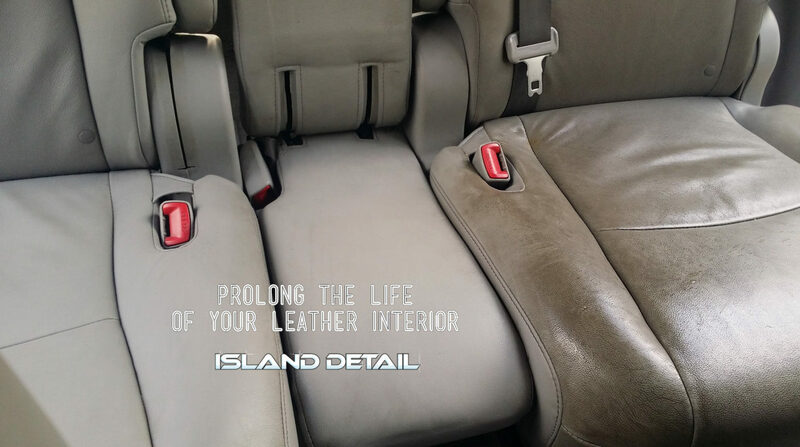 Leather that’s absorbed a lot of water also tends to stretch and lose its shape, so is steam cleaning your vehicles leather interior a good idea? The answer is in the approach. Applying too much steam will result in water coming into contact the leather, getting absorbed and potentially causing damage. However if you ensure the right distance between the steamer and the surface of the leather, you’ll be able to clean without damage. What Does Steam Cleaning Leather Actually Do? Steam cleaning sterilizes surfaces, kills germs and loosens grime and soil, and should be reserved for an annual or bi-annual detailing. Routine leather care should be done with your vacuum and water dampened cloth, reserving the steam cleaning for a visit to a professional detailer. Steam cleaners are available to purchase, but DIY can result in water stains and irreparably damaged leather. A professional uses the steam cleaner all the time, and is aware of the correct temperature settings to kill germs. Professional detailers know the proper distance to hold the steamer so that it’s not too close to the surface causing the leather to become stretched and rippled. Steam cleaning, vacuuming, or wiping won’t remove stains. So prevent stains where possible, and read the manufacturers guidelines for the recommended cleaning and treatment products for those small stains. When you need that annual clean, stain removal and long lasting protection, you can click here to read about how we do it, and then give us a call to set up an appointment.